Pam is well known and respected in the artist community. 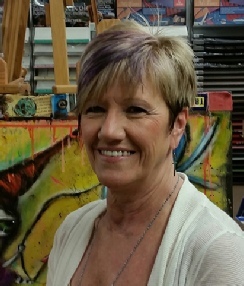 She is self taught with extensive knowledge of most artist material and media gained from more than thirty years working for Alabama Art Supply. Each morning Pam begins her day around 5:30 am in a time of devotion. Soon after a quiet time she begins to paint. For Pam the painting is only an extension of her prayer time, relaxing and preparing her for the day ahead. Pam hopes that people will look at her work and see the many layers of paint, paper, pen & ink, printing and other techniques used in the making of each painting. The paintings are sometimes a reflection of who we are with our many layers.